If you are one of those people that think Fried Chicken and Waffles doesn't belong together and still haven't tried it.. then come here for the first time. But I am warning you, this restaurant sets the bar high. Located on the south side of Chicago, this restaurant has become a staple in the soul food community. 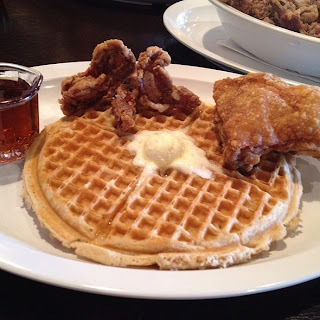 They offer some of the best fried chicken and of course the waffle as the best vessel to serve chicken. The sides are soul food label worthy and the atmosphere is very laid back with talkative waitresses. Unfortunately, what is keeping from a perfect rating is the service. Slow is an understatement, but I guess with great company, it shouldn't matter right? Overall, the history of this restaurant, along with its homestyle cooking, I can confidently rate it at 4.5 miles. Definitely try it out, you will not be disappointed. So before one of my friends left the city, her request was to get Chicken and Waffles. We decided to head to my favorite place... Here, we each ordered the typical chicken and waffle and shared just about ever side they offer. For description of the main entree, see below. Now, for the sides... these are true soul food dishes. First of all, the mac & cheese is rich and creamy. The red beans and rice has a little spice, but reminds me more of a classic hop and john's rather than red beans. The greens were stewed for hours with bacon and that corn bread was both moist and buttery. Small chunks of corn can be seen as well. I suggest making one soul food bite... mix a little of everything, including the chicken, waffles, and maple syrup and you will be in heaven. If hesitant, try the mac & cheese with a little syrup first. I promise, you will be hooked. AMAZING food... AMAZING. The name of the restaurant decided my meal. I chose the plate that came with one piece of fried chicken (thigh) and their waffle. The waffle was lighter than expected and had a mild sweetness to it. It was topped with a dollop of butter and served with a side of warm syrup. Now for the chicken... You can tell they fry their chicken often because it is served piping hot with the skin being as crispy as can be. I really suggest covering everything with the maple syrup. This helps to tie everything together, giving that coveted sweet and salty combination that I especially love. Highly recommend this dish! These have just been one of my favorite dishes whenever eating "soul food." So, I tried them here. They had a nice crisp to the outside with the breading not laid on too thick. Unfortunately, the gizzards were as chewy as rubber. At one point, my jaw even started to hurt from chewing so much. I have had much better gizzards else where and wouldn't recommend ordering them here. - Order the Chicken and Waffles... whatever combination you desire. - Also order the Mac & Cheese... I tried a bite of my friend's and wish I ordered my own. - Ask about sweet potato pie... they always seem to run out whenever I am there. 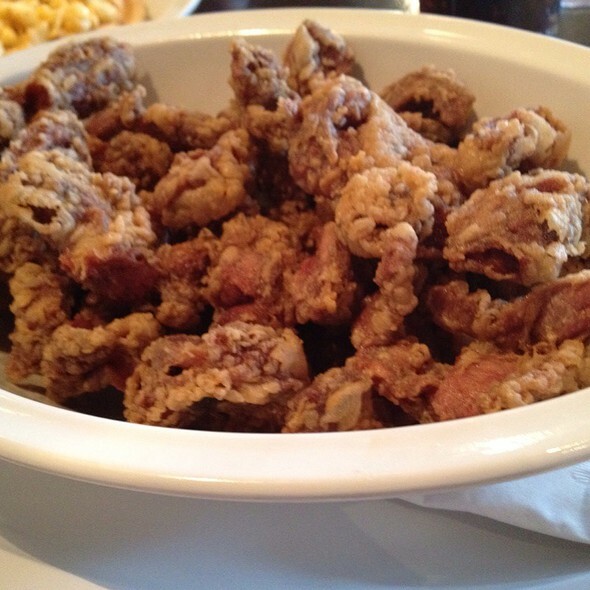 - Don't get the gizzards unless you want to chew for hours. - Get their at an "off time" because its pretty busy during the peak meal times!